LIVING FOR THE MOMENT - 2013 Living for the Moment was inspired by the incredible response Peter received from his debut solo album, Revelation. The album consists of a number of brand new songs and also includes a few “updated” versions of songs that originated on two of Off The Edge albums. (Off The Edge is Peter’s melodic rock project that has been in existence since 1983.) Larry Rose played drums and percussion. “It was a pleasure and a privilege working with you, Larry. Your style came through on every track and formed the backbone of the entire album. Thank you so much. You are a monster!” (Peter Hanmer) Guitars used were Gibson Les Paul Standard, Gibson Les Paul Studio, Tokai Loverocks, Fender Strat, Takamine nylon string and Ibanez Artwood acoustic. Peter decided to play bass guitar on his own album because Mike Dorea (who played bass on Revelation) moved to Cape Town. Mike did however play on “Race Against Time” which he recorded before he left Johannesburg. At the eleventh hour, Brad Cunningham contributed a worthy blues harp on “Bad Attitude”. Peter played all keyboards. Following the Cape Town theme set in Revelation, the CD cover photograph was taken by John Maarschalk across Hout Bay. The album was produced and mastered at Foxglove Studios and was released on 25 March 2013. February 2014 Track 6: Blues Parade Review by: Marty Peters, Recording Magazine, USA Rating: "Blues Parade" is a (you guessed it) Blues/Rock instrumental. This track is from Peter's album "Living For The Moment", on which he played all of the guitars and bass (at least on this track) but drums are credited to Larry Rose. This month's Spotlight, recorded in a studio Peter built himself near Johannesburg, South Africa, is a superb example of guitar tone and texture, and how to weave them creatively while building an awesome arrangement. Though it is not uncommon for many guitarists to include in their arsenal instruments that employ different pickups, e.g. a Gibson with humbuckers along with a Fender Strat/Tele with single coils, and perhaps more esoteric choices such as guitars equipped with P-90s, mini-humbuckers and Filter-trons, we have rarely heard them presented so distinctly or successfully. The track intros with a nicely recorded and beautifully panned conga part leading us into a funky full band groove with a NASTY (in a good way!) sounding lead guitar. The tone here is in the Warren Haynes/Gary Moore camp, distorted but rich and full with great note definition and sustain. At approximately 1:10 into the song, Pete switches to a distinctly single coil sound, a little "quacky", but no less impressive, oh and did we mention the brother flat out burns on the guitar! The goodness continues with a palate-cleansing acoustic guitar/keyboard interlude at 1:58, providing our senses with a well-arranged and beautifully recorded respite prior to Peter launching into yet another killer solo, this one showcasing some bridge pickup bite. Finally, at 3:22, Pete goes for all the marbles with a dual panned HEAVY rhythm guitar track in support of his final solos, before ending it all with an awesome acoustic "Stairway to Heaven" homage. Suggestions: As you may have guessed, we were mighty impressed... not only by the skill level and "tone-age" here, but also with the seamless transitions in the arrangement. So often in this type of piece, we hear level disparities and energy drops between sections, but Peter has managed to take us from sound to sound effortlessly, navigating his mix with aplomb. We should also mention that the rhythm section, while basic, provides a perfect support cast for the guitars. Lastly, Peter receives extra Spotlight kudos for the oh so tasty "shadow and light" he affords the arrangement during the three acoustic sections of the song. Well conceived, well played, well arranged. (We were tempted to disqualify him for telling us about his pickups but not about his studio monitors, but... nah.) Summary: Lots of folks can riff... fewer can have it mean something! 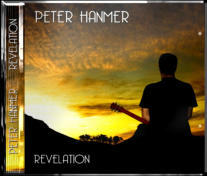 12 April 2013 Review by: Leon Economides, Rockit Scientist (Rockfest on MixFM 93.8) “Peter Hanmer’s new album, “Living For The Moment”, is a natural and excellent successor to “Revelation”, which was released midway through 2010. Featuring re-worked versions of tracks such as “Blueprint”, “Guiding Light” and “Ovation”, the album sees Peter exploring a more blues/rock direction, with the fantastic “Blues Suite”, which is comprised of three tracks, demonstrating the versatility and sheer class of this most gifted musician/producer, who has become highly regarded as one of South Africa’s best and most respected guitarists. His live work with Off The Edge and Clint & Co is legendary, and he has used this experience gained, together with his undoubted talent, to release an album that surely deserves its rightful place as one of the best guitar-dominant instrumental albums to have been released in South Africa in recent years. Tasty rockers such as “Lightning Strikes”, “Bad Attitude”, which features sterling blues harp by Brad Cunningham, and bonus track “Speed Freak’’, add a fantastic balance and diversity to an album that should see Peter Hanmer finally enjoy the acclaim he so richly deserves, not only as a musician and songwriter, but as a producer as well. With the legendary Larry Rose on drums, and Mike Dorea on bass on one track, Peter handles all guitar, bass and keyboards. This is an expertly produced and recorded album that will undoubtedly be appreciated by lovers of blues, progressive and classic rock.” 23 April 2013 Review by: Zoran, SA Guitar Forum "When I moved from Europe to SA 8 years ago, the first thing I was looking for was good music. I started with Dan Patlansky - I was blown away. I couldn't believe how someone so young could have "grown" to have such a well formed blues soul. Second thing was Lucky Dube band, I played with them as a guest guitarists at Carnival City, fantastic guys ! It was an amazing experience for me. Then I met Peter Hanmer at the Tanz Cafe in Rivonia at a live gig... It was an awesome experience for me, again! I like his playing and music character, he retains that "vintage" approach to guitar and music arrangement, but using modern equipment and sound. There is some latent power in his playing, not the way1000bpm shredders play, but with more silence between notes. The master art of playing guitar with silence, very often missed out by modern guitar players. Looking forward to your next live gig Pete! Recording began in March 2010. The drum recordings were completed within 6 weeks. The drummer, Mirko Kesic, used a TAMA Star Classic Maple drumkit for all his parts. Mike Dorea was invited to play bass and he completed his parts in May. Mike used a Fender Jazz Bass (5 string) and an Ampeg SVT4 bass amp. The guitars were recorded using the Marshall JCM 2000 TSL602 with a Shure SM57 microphone. Most of the distorted tones came from the MI Audio Crunchbox pedal. Guitars used were Tokai Sunburst Flametop, Fender Strat, Takamine nylon string and Ibanez Artwood acoustic. Once all the guitars were laid down, Peter asked Dave Sharp (who has a Hammond C3 organ in his studio) to record some organ parts on two of the tracks. Dave obliged with some really wonderful organ playing. By the end of May all of the recordings were completed and the final mix was handed over for mastering. The album was produced and mastered at Foxglove Studios and was released on 15 June 2010. WIDE OPEN SPACES - 2016 A lot of the tracks on this album stem from Peter’sLine 6 gear demo videos. Each time he produced a video he wrote a new piece of music. These 'songs' became the basis of many of the tracks that ended up on Wide Open Spaces. Also included are a few songs written and recorded in early 2000. These were done in his project studio without live drums and some other live instruments. This was a great opportunity to get Dave, Grant and Larry involved to help give these tracks a new lease on life. He paid tribute to one of his heroes, Alan Parsons. He has been a massive influence in Peter’s writing and recording of his music. The final track, Distant Horizon, is his tribute to Alan. Dave's Hammond contribution to Unfinished Business and Riff Valley, the inclusion of his songs, Grant's nylon string guitar part and Larry's drumming has turned this album into a truly collaborative effort. “We've had a lot of fun these past 3 years putting this album together. I truly hope that you will enjoy listening to it as much as we enjoyed recording it.” Wide Open Spaces was produced and mastered by Foxglove Studios and released on 27 June 2016. 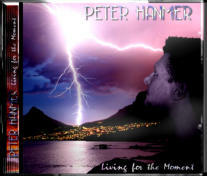 Peter Hanmer recently released a purely instrumental album. You will not find instrumental pyrotechnics of players who are simply intent on impressing their audience, but you will experience the vastness and contemplation suggested by the title track. In this, Hanmer is a master of understated brilliance in composition and arrangement. The overall sound of the album is highly polished and beautifully balanced. The interplay of instruments is so well arranged that backing effortlessly carries melody. The engine room of bass and drums drives each piece like a finely tuned high performance car, but is never overwhelming. As brand ambassador for Line 6 Gear, Hanmer wrote a number of pieces as video tutorials to demonstrate various aspects of the kit. These pieces became the basis for “Wide Open Spaces”. Therefore, to call it a concept album may well be a stretch. However, it is defined by the title track, and cuts such as “Distant Horizon” (Parts 1 & 2), “Chasing Rainbows”, and “The Long Road Home”. Hanmer is responsible for all but two compositions, and most of the instrumentation. Larry Rose (formerly of Hotline, Cinema, Clint & Co) provides drums and percussion. Dave Sharp has added in some Hammond Organ parts. On his own composition – “Everything Goes, Parts 1 & 2” – he also plays keyboards, bass and sax. There is also the work of Grant Tregellas, who plays nylon string acoustic guitar on “Everything Goes, Part 2”. You may be forgiven if you think you are listening to a number of influences rolled into one. By his own admission, the Alan Parsons Project influence dominates. He has also acknowledged the Pink Floyd influence. Listen more closely and you can possibly pick up elements of Gary Moore, Joe Satriani, Trevor Rabin and Stephen Stills. Finding similarities of style is nothing strange in the rock guitar genre; but here’s the thing: Hanmer has managed to take all these styles, and make them uniquely his own. The opening cut, “Distant Horizon Part 1” is almost like an overture that defines the expansive nature of the album. “Addiction” is a reworked version of a previously released Off the Edge piece to “give it what it deserves,” according to Hanmer. Many of the cuts are structured in separate tempos, with variations on themes and tempos to make it more interesting. The most striking is the way in which “Distant Horizon Part 2” moves from a dominating opening into a quiet section, and then hits you with the full impact of the finale. On “Wide Open Spaces” there is an expansive opening phase, which then shifts into a slow, but driving section, announced by bird-like sounds. The opening theme is then reintroduced for the finale. For guitar afficionados there are pieces in which Hanmer plays “duets”, using a Strat and a Les Paul. This is quite marked on “Still Want You Back”. He also does this on “The Long Road Home”. Acoustic nylon- and steel string guitars also feature strongly. The most notable of these is the contribution of Grant Tregellas on “Everything Goes, Part 2.” One can but marvel at the timing of these switches between instruments. There seems to be very few albums, certainly produced in 2016, that are of such a high quality. In short, the sheer musicianship, engineering, and arrangement should make this an international hit. This almost certainly will not happen immediately. It’s the kind of album that grows on you the more you listen to it. Hopefully radio stations pick up on this gem and give it lots of airplay. Cape Town born Peter Hanmer is a South African guitarist, composer and session musician. He also happens to be the brand ambassador for Line 6 SA, which produces an extensive range of amps, pedals, effects boxes and more. Hanmer has been playing guitar since his early teens and has a long list of band credits to his name, stretching as far back as the early 1980's and including the likes of Boss, Streetalk, The Mattison Brothers, Domino, Times Two and Clint & Co. Studio side projects include Off the Edge, which has yielded five albums and the one off Age of Innocence. His interest in studio recording and techniques was spawned by his father, a hi-fi enthusiast, who owned a reel-to-reel recorder with overdubbing capabilities - which meant the young Hanmer often turned the family living room into a recording studio. 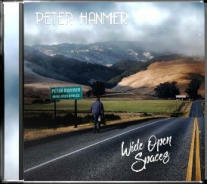 Wide Open Spaces is Hanmer's latest solo effort and features his versatile virtuoso and often lyrical lead guitar work on a range of self composed songs best described as anthemic, melodic rock. The music is polished and accessible with a strong turn of melodic phrase and reflecting a spectrum of influences ranging from The Alan Parsons Project to Pink Floyd. Given his studio background (Hanmer owns Foxglove Studios where this set was also recorded and mixed), the production is admirable, with a strong sense of clarity, generous staging and close attention to detail. Also featured on the 12 track set are session veterans Larry Rose (drums), Dave Sharp (keyboards) - who also wrote one of the songs and Grant Tregellas on acoustic guitar. It's an absorbing set with great musicianship.